South Australian Artist, Deanna Kernick started up her business Mosaics by Design in May 2001 after finding that her passion for mosaic art was becoming more in demand. Since then she has been kept busy by countless commissions. 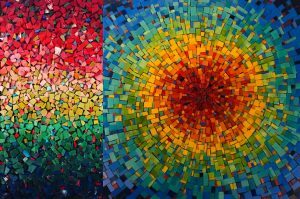 Spending one month in Italy in 2006, where she attended the Ravenna School of Mosaic proved to be inspirational and the works or Art she produces are proof of how much she has grown as an Artist. Adelaide’s Mediterranean climate lends itself to courtyard gardens and rendered walls which are a wonderful backdrop for a mosaic design. Deanna’s unique style and eye for detail have made her mosaics widely sought-after in many South Australian Gardens. Her clients also include people from Perth, Darwin, Sydney, Queensland and Bali. To date her commercial clients have been councils, hospitals and restaurants. Deanna’s extensive residential portfolio includes floors, water features, swimming pools, murals, splashbacks, bathroom murals, bars and tables. Her commissions are created with great thought to the surroundings and to each clients individual taste and colour scheme. Deanna is able to add spectacular focal points to garden designs which add light, colour and movement through the use of textured glass and mirror. Her method of hand shaping every individual piece has proved popular. 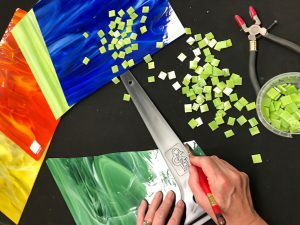 Although she enjoys mosaicing in the traditional method of cutting small square tesserae as used in the ancient mosaics, quite often, Deanna will blend the two styles together. Mosaics can be fitted to rendered foam, rendered blue board and brick walls. They can also vary in size and shape depending on the clients requirements. Installation is provided on all jobs if required and the turnaround time for a 2 metre square mosaic is usually 8 to 12 weeks.